Manufacturer of a wide range of products which include mechanical vacuum booster system, mechanical vacuum booster for process industries, mechanical vacuum booster for distillation industries, mechanical vacuum booster for vacuum freeze drying, mechanical vacuum booster for oil re- refining and vacuum pump for solvent recovery. We are highly affluential firm involved in exporting and supplying Mechanical Vacuum Booster System. These systems comprises of watering vacuum pump, oil seal rotary high vacuum pump and liquid jet or steam jet ejector. Due to their fabrication being done with the use of finest grade steel and modern-age technology, these systems are suitable for use industries. In addition to this, we make the prompt delivery of products in defect-proof packaging. Available with any type of vacuum pump or ejector. Mechanical Vacuum Booster for Process Industries comprising of Watering Vacuum Pump or Oil Seal Rotary High Vacuum Pump or Liquid Jet or Steam Jet Ejector. We also offer our SYSTEM with Common Base Skid, Inter Condenser, Piping, Valves, Instruments, Electric Motor, Control Panel, Variable Frequency Drive, PLC Base Panel Etc as per Customer parameters. Mechanical Vacuum Booster for Distillation Industries comprising of Watering Vacuum Pump or Oil Seal Rotary High Vacuum Pump or Liquid Jet or Steam Jet Ejector. We also offer our SYSTEM with Common Base Skid, Inter Condenser, Piping, Valves, Instruments, Electric Motor, Control Panel, Variable Frequency Drive, PLC Base Panel Etc as per Customer parameters. Mechanical Vacuum Booster for Vacuum freeze Drying comprising of Watering Vacuum Pump or Oil Seal Rotary High Vacuum Pump or Liquid Jet or Steam Jet Ejector. We also offer our SYSTEM with Common Base Skid, Inter Condenser, Piping, Valves, Instruments, Electric Motor, Control Panel, Variable Frequency Drive, PLC Base Panel Etc as per Customer parameters. 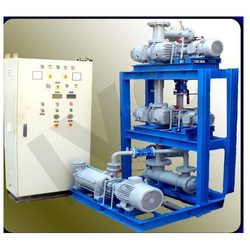 Mechanical Vacuum Booster for Oil Re- Refining comprising of Watering Vacuum Pump or Oil Seal Rotary High Vacuum Pump or Liquid Jet or Steam Jet Ejector. We also offer our SYSTEM with Common Base Skid, Inter Condenser, Piping, Valves, Instruments, Electric Motor, Control Panel, Variable Frequency Drive, PLC Base Panel Etc as per Customer parameters. Mechanical Vacuum Pump for Solvent Recovery comprising of Watering Vacuum Pump or Oil Seal Rotary High Vacuum Pump or Liquid Jet or Steam Jet Ejector. 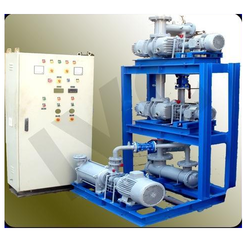 We also offer our SYSTEM with Common Base Skid, Inter Condenser, Piping, Valves, Instruments, Electric Motor, Control Panel, Variable Frequency Drive, PLC Base Panel Etc as per Customer parameters. Looking for Mechanical Vacuum Booster System ?